Triple H was the name of a '90's professional wrestler known early in his career by the stage name Terra Ryzing. 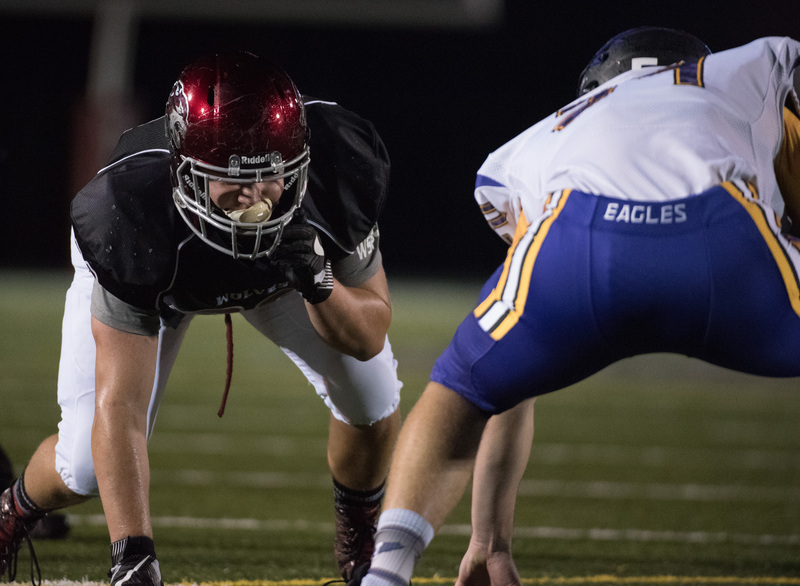 Friday night, the Wolves own Triple H of "Howard, Hunter and Hank" was Terra Ryzing to the Issaquah Eagles on homecoming night in a 49-7 Eastlake victory. Eastlake came into the game (5-2 overall, 3-2 in KingCo) knowing that a win would secure a spot in the post-season. Issaquah came in struggling through their toughest season in recent memory (1-6 overall, 1-4 in KingCo). The Wolves got off to a fast start. On the second play of the game, Ben Howard hit Parker Lester with a short pass which Lester turned into a 67 yard touchdown. Taige Thornton knocked through the PAT (the first of his 7 successful PATs on the night) and the Wolves led 7-0 just 48 seconds in the ballgame. On Issaquah's first offensive series, Ryan Stinnett tackled the ball carrier for a loss on 3rd and 1, setting up 4th down. Hunter Klinge fielded Issaquah's punt and returned it nearly 70 yards before fumbling at the Issaquah 10 yard line. Issaquah recovered the fumble and immediately hit a 35 yard pass completion into Eastlake territory. It looked like the Wolves defense would make a stand when Eric Plummer intercepted an Issaquah pass, but a roughing-the-passer penalty let Issaquah retain possession. After a pass interference call set up Issaquah inside the 5 yard line, they hit tight end Max Dahlquist with a touchdown pass and tied the game 7-7. The Eagles built on their momentum and fired up the visiting fans when they attempted, and recovered an onside kick on the ensuing kickoff. Although Issaquah drove into Eastlake territory, cornerback Klinge atoned for his earlier fumble by intercepting the Issaquah pass and returning it to the Eastlake 18. Howard hit Pladson with a short pass, which Pladson took 65 yard for paydirt and an Eastlake 14-7 lead at 1:29 remaining in the first quarter. Throughout the second quarter, the Wolves battled themselves with fumbles and penalties as much as they battled Issaquah, but nonetheless built on their lead. On the next series, Issaquah fumbled, giving Eastlake a short field from the Issaquah 28. After hitting a 15 yard Howard-to-Max Gardiner completion, the Wolves fumbled the ball to Issaquah on the 7 yard line. However the Eagles turned the ball right back by throwing an interception to Pladson who returned it to the 10 yard line. Howard then hit Pladson for his 2nd touchdown of the night to put the Wolves up 21-7. After another Eastlake defensive stop highlighted by the sure tackling of linebacker Noah Morse, a long Eastlake drive stalled amidst a series of penalties. Eastlake punted and Klinge downed the punt on the Issaquah 6 yard line. A few plays later Klinge intercepted an Issaquah pass with 42 seconds remaining in the half. With the clock ticking down, Howard hit Pladson with a highlight reel 34-yard touchdown pass (check it out on Twitter, @Hplady442) followed by a "not top 10" touchdown celebration featuring Lester landing upside down. Eastlake went into halftime with a 28-7 lead, but clearly dissatisfied with their first half mistakes. At halftime, the players took over the locker room with senior captains Plummer and Daniel Bradley challenging their team to play to their potential in the second half. Coach Don Bartel followed his captains' lead by allowing the defense to call their own plays to start the 2nd half. The strategy worked as the Wolves came out focused and dominated the 3rd quarter. Issaquah received the second half kick but the Wolves’ Colin Booker forced a fumble which Morse pounced on to give the Wolves another short field. Chris Nelson ran in an 8-yard touchdown to put Eastlake up 35-7. After another strong defensive series featuring strong play from tackle Ryan Guptil, the Wolves offense took over and scored again, this time on an 11 yard Howard-to-Bradley touchdown pass (42-7). On the last play of the 3rd quarter, the Eagles offense was stuffed once again for a 3-and-out. When the Issaquah punter struggled with the snap, he got off a short kick which set up Eastlake once again in Issaquah territory. On the first play of the 4th quarter, Bradley scored his 2nd touchdown on a 45 yard run pushing the Eastlake lead to 49-7. In the 4th quarter, under a continuously running clock, the Wolves substituted liberally but the defense kept up the pressure. Junior safety Jaxon Williams intercepted his 2nd pass of the year and returned the ball 35 yard to the Issaquah 40 with 8 minutes left in the game. 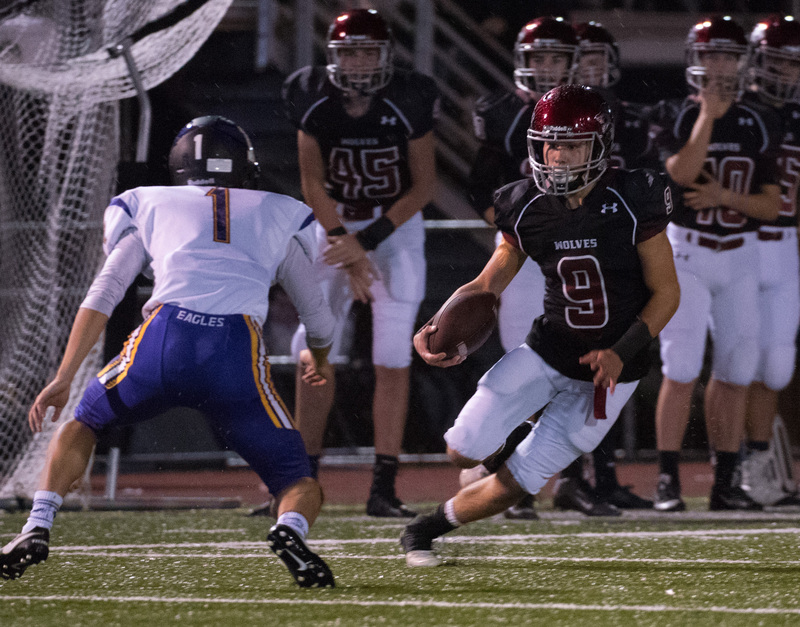 With senior quarterback Colton Padgett hitting quick passes and junior Sam Milton providing a power running game, the Wolves ground the ball down the field and ate up clock. With a minute left, Padgett appeared to scramble for a touchdown but was called out of bounds at the 3 yard line. The Wolves passed up the scoring opportunity and went into victory formation for the final play for their 49-7 homecoming win. The Wolves piled up 460 yard of offense while holding the Eagles to 159 total yards. Stars of the game included the offensive line of Kyle Sihon, Stinnett, Plummer and junior tackle Connor Doran and Spencer Thompson who protected Howard all night and opened up running lanes for Nelson and Bradley. Bradley demonstrated that he's fully back from his injury showing bursts of speed and power and a number of "did you see that?" cuts. Defensively, Booker, Stinnett and especially Guptil dominated up front, allowing linebackers Morse and Plummer and safety Pladson to pile up tackles. Howard threw for 305 yards and once again matched the school record with 5 touchdown passes. Bradley rushed for 8 yards per carry and Lester (135 yards and a touchdown) and Pladson (119 yards, 3 touchdowns) torched the Issaquah secondary. Sophomore kicker Taige Thornton was outstanding, hitting 7 of 7 PATs. 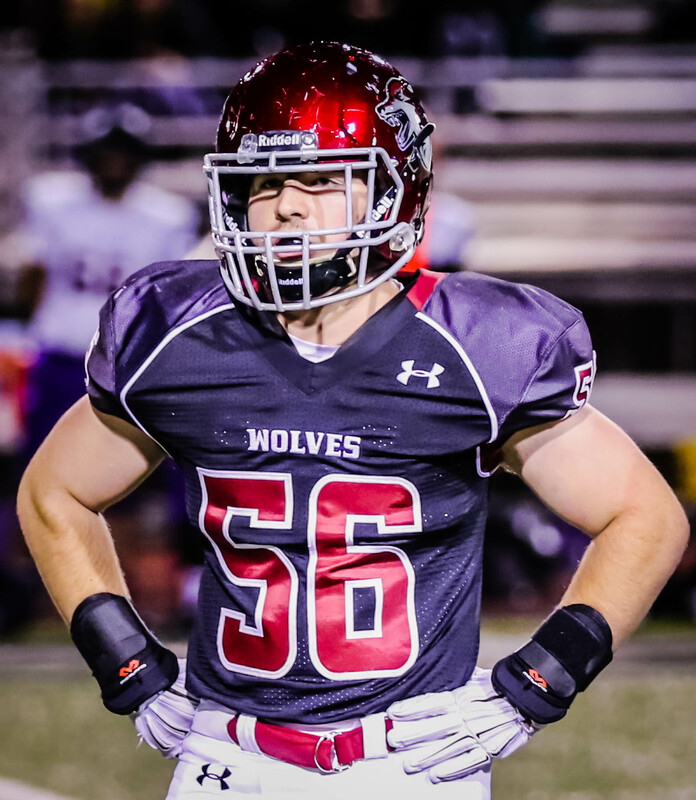 Next up the Wolves (6-2, 4-2 in conference) host the undefeated KingCo champs, Woodinville (8-0, 6-0 in conference) next Friday on Senior night. Woodinville's defense is the best in the league and one of the best in the state which should set up an exciting matchup with Eastlake's explosive offense.